As a young boy growing up in the early 1960s, I felt like all was right with world. I had great parents, a great sister, great friends and I was just starting to see my love of sports blossom. My dad started taking me to Milwaukee Braves games where I was able to see players like Hank Aaron, Eddie Matthews and Warren Spahn. I also started to become an ardent follower of the Green Bay Packers, who won back-to-back NFL titles in 1961 and 1962. I also had a picture of President John Fitzgerald Kennedy on my bedroom wall. I didn’t know much about politics at that age, but I know I was happy he was President. While I was in kindergarten, the Cuban Missile Crisis occurred in October of 1962. Thankfully, JFK decided to use a naval blockade to end the drama with the Soviet Union after they had placed medium-range and intermediate-range missiles into Cuba. Had JFK listened to the Joint Chiefs and invaded Cuba instead, there was a very good chance that World War III would have started. Fortunately, the naval blockade worked and the Soviets pulled the missiles out of Cuba. Then a little over a year later, everything changed. I can remember precisely where I was when President Kennedy was assassinated on November 22, 1963. I was in the first grade at Corpus Christi grade school in Milwaukee, Wisconsin. Our teacher sent us all home after lunch after the word came out that Kennedy had indeed been assassinated. I was never comfortable about the official story that Oswald was the lone assassin. Even as young as I was. Perhaps that was because my dad was not convinced that it went down that way either. My feelings were confirmed when dad brought home Rush to Judgment by Mark Lane a couple year’s later. Lane’s book really opened my eyes. It also made me realize that Oswald didn’t even take part in the assassination. He was “a patsy”, just like he said he was. Then came June 5, 1968. My mom and I both stayed up late to watch the California primary in which Bobby Kennedy won. Bobby was his brother’s Attorney General when JFK was President, but later became a Senator from New York when he ran for President. Mom and I saw Bobby’s speech and then we heard the news that RFK had been shot. We were obviously shocked like everyone was. I basically stayed up all night trying to get more information about what happened and to check on the status of Bobby. At the time, I was an altar boy at Corpus Christi and I was scheduled to serve the first Mass of the morning. As I was getting ready for the Mass at church, I saw the priest who would doing the Mass and I told him what had happened to RFK, as he was unaware. I told him that Bobby was shot in the head, but was still fighting for his life. He almost fell over with shock and anguish, as he was a big supporter of RFK and the civil rights movement. When Mass started, the church was only about a quarter filled, as summer vacation had started at school, plus this was a Wednesday morning. Almost immediately the priest announced to the crowd what had happened to RFK the night before. The response was surreal, as people were gasping, shrieking and sobbing with the news. There wasn’t a dry eye in the church. We all said a prayer for Bobby, but as we know, he later succumbed to his fatal wound and died on June 6. From that point on, I tried to read as much as I could about what really occurred when both JFK and RFK were assassinated. That was also about the time Jim Garrison started his investigation about the JFK assassination. I followed that case quite closely. A few years later, while I was at the University of Wisconsin-Oshkosh, I heard that Vincent Bugliosi was going to speak at our school. Bugliosi was famous for being the prosecutor in the Charles Manson murder trial. I had read his book Helter Skelter, which documents how he successfully prosecuted Manson and some of his followers in the Tate-LaBianca murders. Bugliosi was going to speak not only about the Manson case at our school, but also about the RFK assassination, which really lit my interest. I was floored by what Vince had to say. Bugliosi told us that the RFK assassination was a conspiracy which reached to the highest levels of government. Wow. But it sort of made sense in my mind, as the JFK assassination had many of the same trademarks, based on the books I had read and the research I had done. About 11 years later in 1986, Showtime had a 21-hour mock television trial of Lee Harvey Oswald, which was filmed in London. Bugliosi played the role of prosecutor in trial, while Gerry Spence was the defense attorney. At the end of this mock trial, the jury found Oswald guilty. I was a bit bewildered at that point in time. Think about it. If Bugliosi thought that the RFK assassination was a clear conspiracy which reached the highest levels of government, surely the JFK assassination had similar or even stronger evidence that was also the case. Basically I thought that Bugliosi was just playing a role as prosecutor in this case. A role in which he was very good. Surely he didn’t believe that Oswald was the lone assassin. But in 2007, Bugliosi wrote another book called Reclaiming History: The Assassination of John F. Kennedy. That 1,612-page book basically said that the Warren Commission was right. Lee Harvey Oswald was the lone assassin. I was flabbergasted with the opinion of Bugliosi. Especially comparing that book with what he told us in 1975 about the RFK assassination. Something was amiss. At that point in time, I had become a pretty passionate researcher regarding both Kennedy assassinations. I read as many books as I could, plus used the internet to find more information about those two murders. While this was ongoing, I happened to hook up with another researcher. 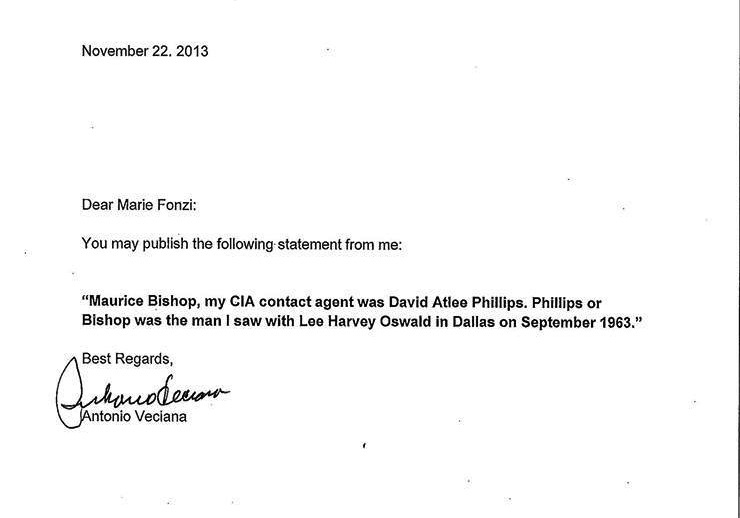 This particular researcher had long been studying David Atlee Phillips, who had been in the CIA for over 25 years in his career there. Phillips reached a very high level with in the CIA, when he became Director of Covert Operations in the Western Hemisphere. 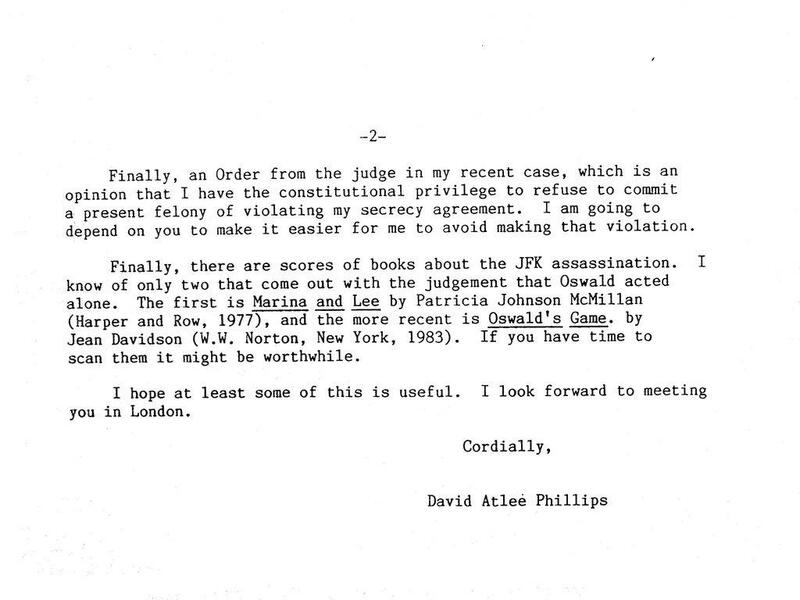 While looking up material on Phillips at the Library of Congress, this researcher happened upon a letter that Phillips had sent Bugliosi in 1986. After I read the letter, things started to make sense to me. Bugliosi had made a key association with one of the most powerful men in the CIA when Kennedy was assassinated, plus was also meeting with him as the mock trial of Oswald was taking place in London. This was all very interesting, because Phillips had been suspected of playing a key role in the JFK assassination. 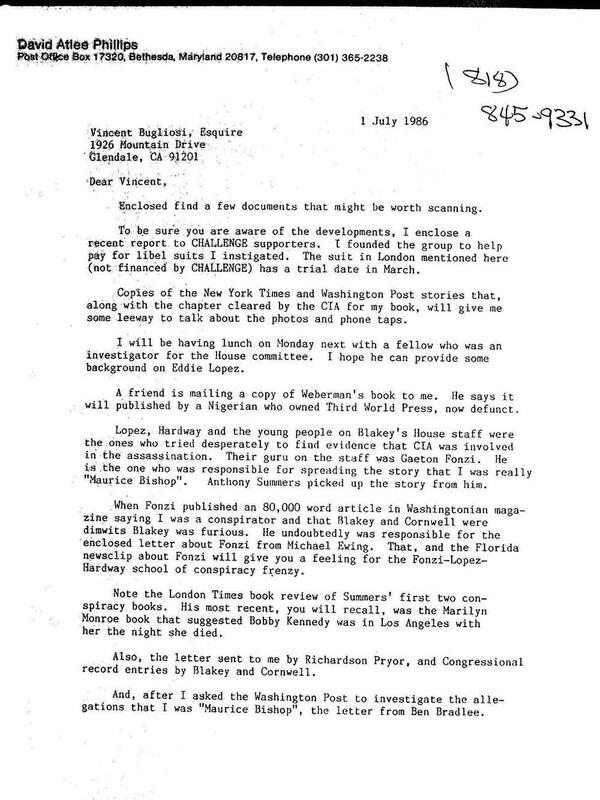 This bring us to Antonio Veciana, who was a Cuban exile leader who worked with a man called “Maurice Bishop” from the CIA. Many researchers have suspected that Oswald was a CIA operative. It make sense if you look at his history in the military. Oswald was in the Marines and was assigned to the Atsugi Air Base in Japan. To work at that air base, one would need a high security clearance to work there, as that is where the U-2 spy plane use to fly out from. Oswald also learned how to speak Russian in the Marines. When Oswald “defected” to the Soviet Union, it was really more of a case of taking part in a mission for the CIA. Coincidentally, the U-2 spy plane piloted by Francis Gary Powers, was shot down in Soviet airspace while Oswald was in the country in May of 1960. Vince Bugliosi passed away earlier this month on June 6. The 47th anniversary of RFK’s death. Talk about apropos. When he died, I immediately thought of his opposite stances regarding both the JFK and RFK assassinations. His opinions on both are 180-degrees different. That never made any sense to me. Not until I read about Bugliosi’s connection with Phillips. Everything became very clear after that.